A Shot in the Dark: Welcome | SHARPEN - Photography News, Business, Art Happenings, Equipment Reviews, and more! If you had told me in high school that I was going to pursue photography as a full time career option, I would have smiled shyly at you and said that while that might be fun, I was going to become a pediatric oncologist. If you had told me in college that I was going to become a photographer, I would have said, maybe, but only as a side business while I work in International Relations. And yet, here I sit, writing my first column for the American Society of Media Photographers, and working as a freelance photographer and studio manager. The only people more perplexed than I am about how the heck I ended up as a photographer are my parents. To their credit, they don’t voice this confusion as much as it crosses my mind (read: about every other minute) and for this I am truly grateful – the racket inside my head would be deafening. Does the noise in my head bother you? It’s not hard to figure out why Aerosmith sang it and Steven Tyler titled a book with that line. As far as I’m concerned, it has the potential to be a legitimate problem. Racket in my head aside, the elevator speech that I’ve got prepared for when someone asks me why I became a photographer goes something like this: “I’ve been passionate about it for a long time, I started a little side business selling matted prints and notecards of my natural/travel work when I was 17 which went pretty well, got caught up in the sports and photojournalism scene in college, decided to dabble in fashion during an amazing internship one summer to see what would happen, and was hooked. They say your twenties is the time to try things, right?” Follow up questions include, “oh, did you go to school for photography?” (no, I went to Dartmouth and studied languages and cultural anthropology focusing on the Middle East and North Africa) and “did you ever imagine being a photographer for a living?” (nope, not even close). Now that I’ve plunged headlong into the world of photography-for-a-living, including moving to NYC, renting a studio, and “figuring it out,” I’d like to present you with…..
You’ve seen the comics. The amusing charts. The funny little drawings on photography blogs, XKCD, Tumblr, Facebook, Twitter, and all those new-fangled “social media tools” we are supposed to be using to market our business (disclaimer: my alter ego is a crotchety old man who hates technology, the “new generation” and the fact that “tea” no longer just means Lipton). 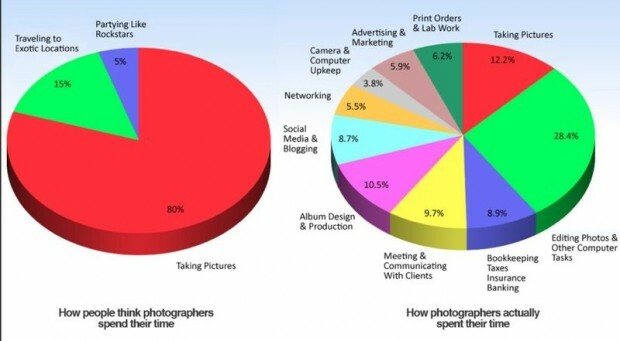 The diagram to which I am referring is the “photographers only take pictures for 10% of the time and do all the business-y stuff for the other 90%.” Well, I’m here to crush your diva dreams and tell you that those diagrams are spot on. In addition to being a photographer, you will also practice and hopefully master the following skills (PS, your business success depends on these): social media wizardry, client pacification & placation, persuasive letter writing, fitting 36 hours worth of things into 24, etcetera etcetera. I joke. But truly, I believe that so many new photographers (and those who care about those new photographers) seriously underestimate the business acumen that is required for one to pay rent with this job. In one day, you will wear many hats, and if you are lucky, one of those might actually be the “photography” hat. I refer to this one as my party hat, and I get very excited when I actually wear it. Thinking about all of the concepts you are going to shoot, and planning out their hypotheticals, does not make you a better photographer. Shooting does. Granted, the former is definitely required to some degree to make any kind of shoot a success, and it can often provide inspiration. But your technical skills do not improve with thinking, they improve with picking up the camera, shooting your subject, and reviewing your photos/looking at what you could have done better. As Shonda Rhimes, creator of #TGIT (in other words, Grey’s Anatomy, Scandal, and How To Get Away With Murder) recently said at a commencement speech, “don’t be a dreamer, be a doer.” That speech is worth a watch; it will simultaneously inspire you and light a fire under your rear. (Watch it here). Back to the “hats” discussion for a moment. More than anything, I would argue that photographers are logistical managers. Some of us hire people to manage the logistics for us, and I look forward to the day I get to do that like a kid looks forward to the day he’s tall enough to go on the rides at Disneyland. But when you are starting out, (and this is most assuredly a column about and for those starting out, though I’d love to think that those more experienced will read this and chuckle about their newbie days) that logistical juggler is you and only you. And your ability to juggle will greatly influence people’s perceptions of how good a photographer you are. If things are smooth and easy for the client, if you deliver goods and payment on time, if you are personable and positive and calm – all of these factors will be taken into account (consciously or subconsciously) and will affect what your client thinks of you and your work. The quality of your work will not erase your client’s memory of your conduct as a professional, whether that conduct was good or bad. Quality of work goes a long way, of course – if you don’t have it you won’t get hired – but it isn’t enough. You have to have both parts of the equation. There are probably infinite things that one can think of to do in any given day to improve one’s business. You will not ever get all of them done. This cuts both ways, and can be motivating to some while completely discouraging to others. To the workaholics (with whom I identify on some days): every task you check off your list is a small victory. Don’t forget that. Also remember that burnout is a very real thing, and will happen to you if you work 24/7. Give yourself a break sometimes, and recognize that your list of how-I-can-better-my-business-and-eventually-become-[insert name of famous photographer in your field here]will never go to zero in one day. The fact that you are making progress on it is what counts. To those discouraged souls (with whom I identify on some days): every task you check off your list is a small victory, and one step further in bettering your business and your skill. You don’t have to do it all in one day. The takeaway here? You might vacillate between workaholic and discouraged soul for awhile. I’d like to think this is normal. Every task you check off your list is a small victory. Last, and most certainly least… I have not met one photographer… not even one… who is good at keeping their blog updated. And inevitably, people who try to make lists on those blogs always run out of things to say once they hit the last number on the list. As have I (for the moment). My last piece of advice… Stick with your blog, your clients want to know you as a person just as much as they want to see great work in your portfolio. Margaret Rowland is an award winning and internationally published photographer who has worked across a spectrum of genres. She learned the art of capturing light on her father's manual Pentax film camera, and now works primarily with Canon DSLRs. 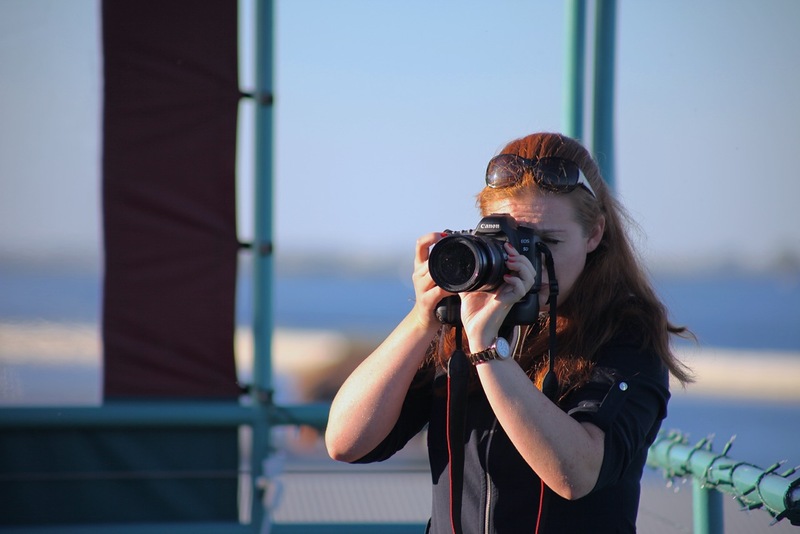 Her work has taken her around the world: from presidential election coverage in New Hampshire for Dartmouth (her alma mater), to documentary and travel/adventure work in Paris, New Zealand, & Kuwait, to wedding photography in California. She currently resides in New York City where she focuses on shooting fashion and beauty, both in her Manhattan studio and on location.